‘In fact, I am a colourist, but since you cannot earn a living by colouring, I also make scenarios and drawings!’ says Cosey. Nevertheless, colouring is the only part of his work Cosey has left to others. In 1969, Cosey himself starts his career in comics by colouring the comics of Derib, at the age of 17. For the ninth Jonathan album (Neal et Sylvester), Cosey works with the colourist Fraymond, whom he knew from the work done for Hermann. The influence of the colourists on Cosey’s later work can not be underestimated. The first Jonathans are characterised by somewhat dark, gloomy colours. Blues and orange-browns are the dominant colours. Also for ‘A la recherche de Peter Pan’, this same palette is used, but at the end of part two, the colors become brighter. 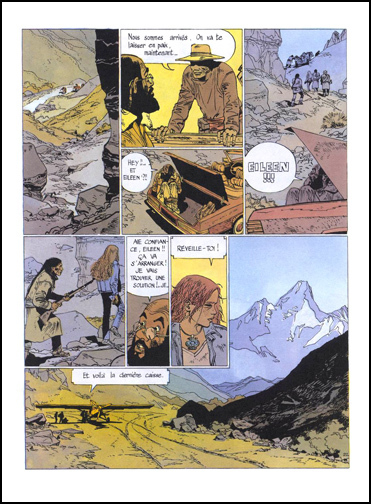 With ‘Le voyage en Italie’, Cosey’s colours become still brighter and more saturated, and there is a wider variety of hues. From this album onwards, the colours become more and more vivid. 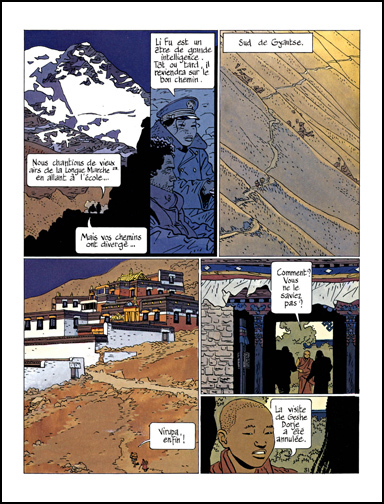 A third colourist with whom Cosey will work is Valott, who colours the re-edition of ‘Le retour de la Bête’ and ‘Zélie Nord-Sud’.